Let’s be honest here—when was the last time you inspected the filter in your range hood? It was probably a while ago, right? Well don’t feel bad, because up until a few years ago, I honestly hadn’t ever given the state of my range hood filter a thought. But one day I was replacing the lightbulb under my range hood, and while I was doing it I caught sight of the filter. It was greasy, grimy, and frankly, pretty disgusting. I knew I needed to do something about it, but I wasn’t sure what! So I did what any good blogger would do, and I did some research online. :-) I discovered an easy and relatively mess-free method that will de-grease even the greasiest range hood filter! After giving it a try, and I was shocked by how well it worked! I was able to bring my range hood filter back from the brink, and gain peace of mind that my range hood could do it’s job. It’s the only method I use to this day! Here’s how it’s done, so you can clean up your range hood filter too! Grab a stock pot that’s large enough to accommodate at least half of your range hood filter, and fill it with water. Bring the water to a boil, and slowly add the 1/2 cup of baking soda. Slowly is the operative word here, as the baking soda will fizz up as you add it to the water. I usually end up adding it about a tablespoon or so at a time. Let the filter boil in the baking soda water for a few minutes, and watch as the grease and grime start to rise to the surface! It’s gross, yet fascinating. Once you’ve boiled the whole thing for at least a few minutes, rinse the filter under hot water from your tap. Once the water starts running clean, you’re done! If there’s still some grease and grime trapped in the filter, refill your stockpot with clean water and repeat the steps again. Finally, prop your clean range hood filter up and allow it to air dry for several hours. Once the filter is completely dry, replace it in your hood vent. And that’s all there is to it! The filter at our studio is practically brand new and wasn’t dirty at all. Luckily, our photographer, Kaitlyn, had a super dirty one at home! The filter is on the older side so it definitely doesn’t look perfect after cleaning, but you can see how the color is almost completely different once all that gunk and grease is boiled off! Amazing! 10 Simple Quick Life Hacks! Amazing, works like magic. Have used this technique a few times & each time it works like a charm. Shared the idea with friends & they all agreed – IT WORKS & very quickly too! Hi just cleaned filter for range hood,using the boining water. My filters were too big for my pot so but filters into sink and boiled water. Added the half cup of baking soda in the sink then poored the water over slow. I let them sit until water cooled down this is the best i have ever gotten clean. Thanks for the info. The boinging water makes the difference. How do you dispose of the scabby water that’s left behind? I’m not pouring that down my sink. I tossed it out in the yard! Thanks so much for sharing. Your right the boiling water looked so gross. Works like a charm! Does this work on Black stove tops!!!? Every time I try and clean my stove top , everything takes away the shine and still leaves the grease behind. Someone please help me!!! I just put mine on top rach of my dishwasher, works like a charm! 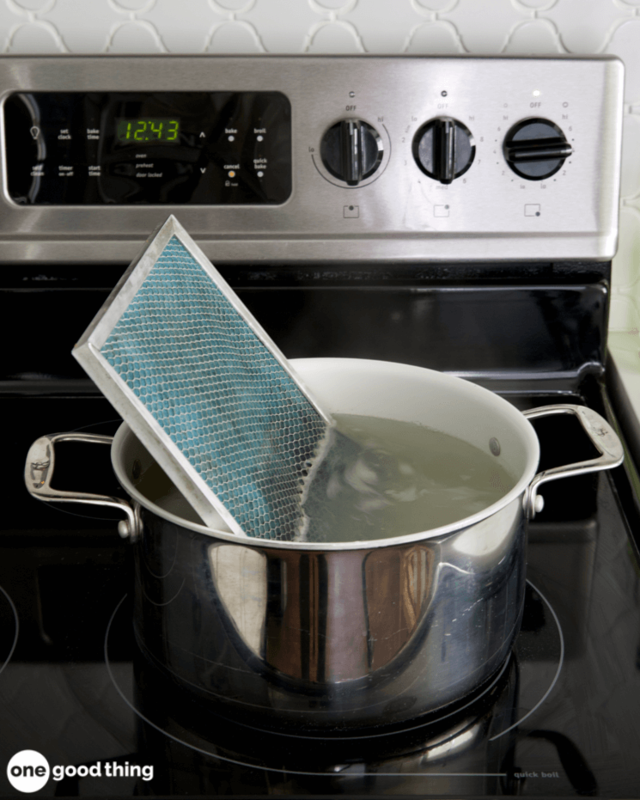 Range hood filter cleaning….WOW! worked like magic! thank you! Uggg, I finally tried this and my biggest pot is not nearly deep enough….although it is wide enough. Thank you for nudging me into doing this job, feel very virtuous now. Was easy!